Once in a while a truly lovely comic comes along that makes me pause and reflect on just how powerful the juxtaposition of images and words can be. Hatter M is such a book, and the series has returned to Kickstarter for its finale. 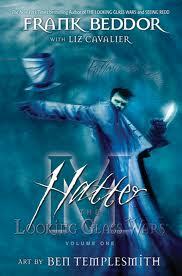 For those unfamiliar with the series, Hatter M is an adaptation/expansion of author Tom Beddor’s “The Looking Glass Wars” series of fantasy novels. As you might expect with such a title, the core of the story is derived from the works of Lewis Carroll, but with an edgy quality absent from the source material. Indeed, Alyss’s (because ‘y’s’ are the second edgiest letter, after ‘x’) Wondertopolis has more in common with China Mieville’s New Crobuzon than with any previous rendition of Wonderland. Likewise, Beddor’s Hatter Madigan is only a distant cousin to popular incarnations of the Mad Hatter. As a high ranking member of the of the Wonderland Millinery, the stylishly chapeau’d fighting corps that protects Wonderland’s royals from threats foreign and domestic, Hatter M is a master things what make people bleed and scream. This is definitely not Johnny Depp’s psilocybin induced Mad Hatter. This is something much, much crazier than that. It is a very strange series, but its characterized by lavish art (in volume #1, provided by the ultra talented Ben Templesmith; subsequently by Sami Makkonen), clever writing (by Beddor and writing partner Liz Cavalier… and even if the puns are achingly painful. Millinery? Seriously? ), and a story resonates with the source material, without telegraphing its next move. In all, I’d classify Hatter M as a must read, if for no other reason than it is one of those rare works that promises a “fresh take on a classic” and actually delivers. What’s more, Hatter M is presently on Kickstarter (for the second time, in fact). Beddor is crowd funding the printing costs of the fifth and final installment of the Hatter M series, as well as editorial and layout costs for the next Looking Glass Wars novel. Beddor returned to Kickstarter after successfully funding the fourth installment of the Hatter M series to the tune of $37,000. Normally, I’m resistant to established creators making serial projects, but in this case, I’m comfortable making an exception. For instance, Beddor managed to deliver on his previous Kickstarter only a month late (or right on time in Kickstarter terms), and his goals some reasonable, attainable, and rooted in need, not greed. And then there is the simple fact that these books are far too lovely to go unfinished. Whether you’re a lover of Wonderland, a lover of graphic storytelling, or whether you adore them equally, you can’t go wrong with Hatter M.